When you’re in the organic fertilizer business, the kind of trommel screen you use is important. Because you’re handling wet materials, you need a trommel drum screen that stays clean and maximizes throughput. Samscreen’s highly qualified engineers can help you find just the right solution for your organics applications. Samscreen has replacement trommel drum screens for organics production. As an organic fertilizer producer, you know the importance of providing quality product to your consumers. Organic fertilizer is essential for healthy crops and gardens, and mixes many different natural elements, such as animal manure, compost from crop residues, vermicompost, oil cakes and biological wastes. Samscreen provides the best replacement trommel screens and parts for the leading brands of organic screening equipment. When you trust Samscreen to meet your replacement trommel drum screen needs, you’ll find that we offer a wide variety of screens for any job. 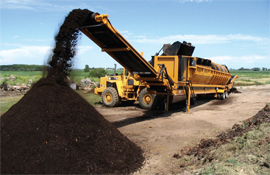 Samscreen builds the trommel drum screens you need for your organic fertilizer business. When you choose us to meet your replacement screen needs, you’ll be able to choose from a number of screen types, including trommel drum screens. To find out how we can provide a custom solution for your organics screening application today, simply call us at (888) 344-3653 and we will be happy to assist you with your replacement trommel screen and wear part needs.